The questions involved how Duke Energy should dispose of the 16 million tons of coal ash currently percolating in an unlined impoundment at the Marshall Steam station on Lake Norman. “How many of you prefer excavation?” Holman said. “How many of you prefer the hybrid?” — a combination of capping the impoundment and a smaller landfill. Confusion ensued. Originally, DEQ had planned for a science-fair type event, in which people would visit booths to learn about surface water, groundwater, dams and other aspects of the proposal. But the crowd was having none of it. Two zip codes in Iredell County have higher than expected incidences of thyroid cancer. Although these cases have not been connected to contamination from coal ash — also used as structural fill beneath area shopping centers and an apartment complex — residents feel anxious. They wanted to speak — forcefully and in front of their peers. They wanted to learn from one another’s questions. On the fly, DEQ changed the meeting format. 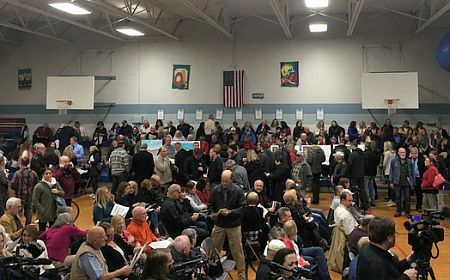 For nearly two hours, residents asked for answers, some of which the department representatives could not provide. “Where has Duke sold its structural fill?” one man asked. Marshall announces itself with an cumulus cloud of steam flowing from stacks that tower above trees on the horizon. But not until you approach the plant on NC 150 do you comprehend its enormity. With metal coal conveyors crisscrossing the site and pollution scrubbers that resemble gigantic clothes dryer vents, the plant sits right along the highway. At rush hour, when the two-lane road is jammed, it can feel as if the plant could devour you. Since 1965, Marshall has generated electricity by burning coal, and like most power plants, it needs water for cooling. Lake Norman provides that water. And the lake also attracts boaters, fishers and residents who want to live close to the water. In the bleachers, residents shared stories with one another of life along the lake that they’ve shared with Duke Energy. “I used to tell my son when he’d go out on the boat to follow the steam” to lead him home, one woman said. Another person’s neighbor dredged part of the shore to build a pier. “He dug up coal ash,” the resident said. A hybrid of both methods. Whatever method DEQ approves, state law doesn’t require it to be completed until 2029. Duke has often cited myriad reasons, such as cost and environmental issues involved in digging up tons of material, for opposing excavating ash from six of its 14 coal facilities. But it is possible, even at a site as large as Marshall. 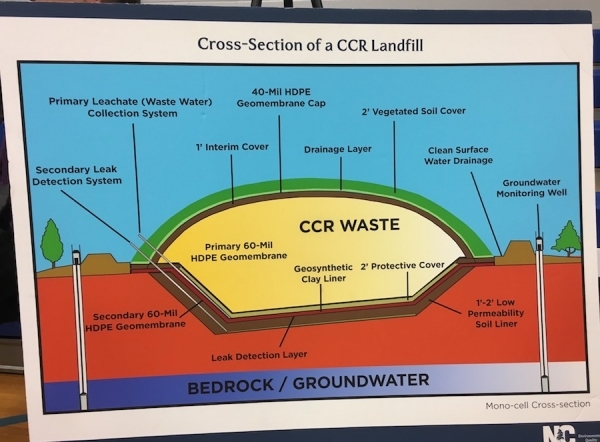 It would require digging up and dewatering the material, much of which is now buried under trees, said Ed Mussler of the Division of Waste Management. Meanwhile, Duke would build a lined landfill onsite on the north end of the property and about a mile from the lake. Trucks would move the ash from one place to another. When finished, the landfill could tower 150 to 175 feet in the air. The entire process would take at least four years. 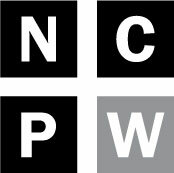 Georgia Power, said attorney Frank Holleman of the Southern Environmental Law Center, is removing all of the ash from a 21 million ton impoundment. And while Duke had initially planned to excavate none of its ash in North Carolina, litigation filed by Holleman’s group forced its hand, and now the utility is removing ash from impoundments at eight of its sites. However, there is no legal mandate to excavate in North Carolina. After the Dan River spill in 2014, the legislature passed the Coal Ash Management Act, which allows Duke, if certain environmental thresholds are met — as determined by DEQ — to leave the ash in its unlined impoundments. Victoria Eaves has lived on Lake Norman for 15 years. And for all of those 15 years, she said, she has driven to Concord to buy water because her home is on a private drinking water well. Currently, there is no evidence directly linking the thyroid cancers and the incidences of rare ocular melanomas in nearby Huntersville to coal ash. But Duke University scientist Heather Stapleton is working with Mooresville activist Susan Wind, whose teenage daughter developed thyroid cancer, to test drinking water and household dust in people’s homes. And Virginia Tech researchers have announced they will begin testing drinking water in Lake Norman neighborhoods, similar to a study they conducted in Robeson County. Although Sawyer was appointed to her seat only last year, she said she would take residents’ concerns to her fellow lawmakers. “We will not stop until we get answers,” she said.